Yes, what you see is the beginnings of a shawl, taped to the floor. Hey! It works! I'm busily knitting away on this spiral shawl, aka Red Tent Blanket, for the class that I'm going to teach in March at Emily's shop. I decided that I really didn't like those star-shaped points in the original Red Tent Blanket, and I'm going to teach this class as a Spiral (only) Shawl. Right now, I'm scouring the 'net for a lace edging pattern. I'm just like Goldilocks, "That one is too big! This one is too small! This one is too narrow! That one is too wide!" I have to find one really fast, because I want to knit the edge tomorrow, and wash/block it in time to turn in to Emily on Saturday. Any suggestions? Oh My Goodness! Check this out! 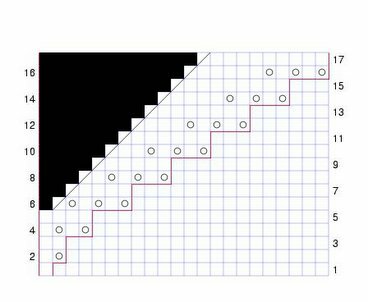 Go to this web page, Chart Creator, and you can make nice, professional charts of your knitting! Quick! Catch me! I'm going to swoon! I can hardly contain myself. ... and here is the *right* way to chart it. I mean, really... does the first chart look anything like the knitted item? No! But, take a look at the second chart, and compare it to the shawl. Now, what do YOU think? My only complaint with this chart is that the row numbers are on either side. 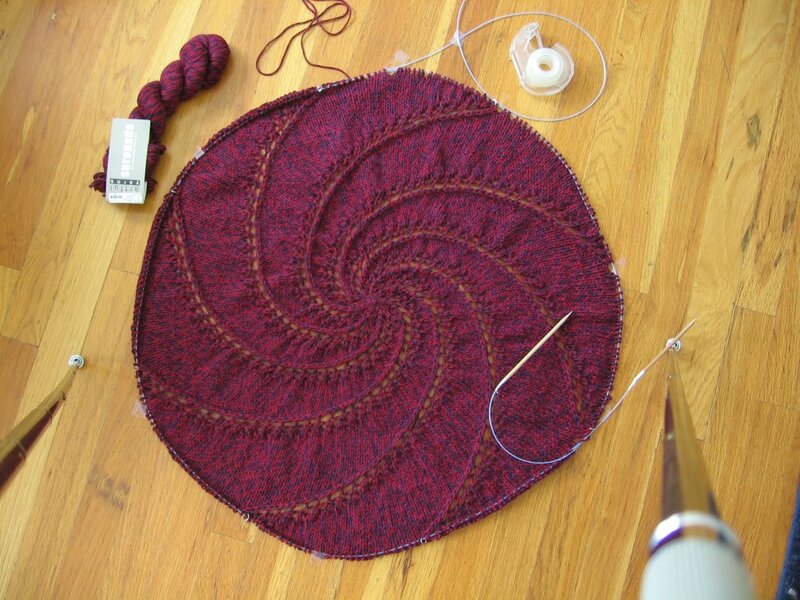 This would make sense, if I were knitting back and forth, but it’s a bit confusing for knitting ‘round and ‘round. Pretend that the numerals are all on the right side of the chart, OK? This might actually be a setting on the chart maker, but since it is 2am, and I’m considering falling face first into the keyboard for a long nap, maybe I’m just overlooking it. I’ll check again, tomorrow. lol. This shawl is really easy, and a perfect beginner project. The circle cast on might be a stumbling block, but just get yourself a good knitting book, practice it a few times, and you’ll be just fine. You can always leave a long tail, and then use the tail to repair any problems later. Round 1 - knit around. You might want to place a marker between each stitch. 2nd round, yo, k, pass marker (pm) all around. 3rd round, knit 2, pm, all around. You are knitting 8 segments, and each segment is identical, and each segment is ended with the marker. Now, you get to the repetitive - every row is just about the same - part. There is a marker after each k2tog, to separate the 8 segments. 6th row, yo, k, yo, k, yo, k2tog, pm, repeat all around. and etc and etc and etc, until the shawl is as large as you want. 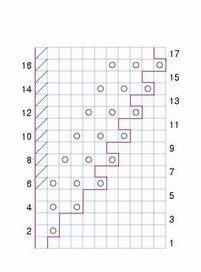 As you knit around, you notice a pattern - once you pass the marker, notice what comes ahead. If it is a yo, then this is a knit round. If it is a knit stitch, then it's time to do the (yo, k) 3x business. There is a k2tog at the end of each segment, no matter what. As you are knitting, you can see this line of k2tog’s coming along, and you can remember to k2tog at the end of every segment. I think that you could even do without the markers, after you are used to what’s going on. Next post - correcting common knitting errors with this pattern, without having to rip out! Ooooh! Pretty! Thanks for the charting link!!! Sheila and I have been looking for something like this. That's a lot like the spiral shawl in A Gathering of Lace too. I made one of those (without the lacy bits in the spiral) and love it dearly. I love patterns that swirl out from the center. They hypnotize me. Yes, this one, and the one in the Gathering of Lace is just a standard doily pattern, only much bigger. This pattern has been around forever. I still don't know what edging to put on it, though. I've never been so indecisive! The spiral blankie is finished, yay!